Replicare® is a hydrocolloid dressing that contains a dense concentration of absorbent material in a thin dressing for superior absorption in the management of exuding wounds. The hydrocolloid dressing hugs curves better and stretches comfortably, with a combination of adhesion and elasticity for maximum wear time, reduced nursing time, and more cost effective use of materials. Bevelled edges help keep the dressing from sticking to clothing or bed linens, reducing the risk of leakage. 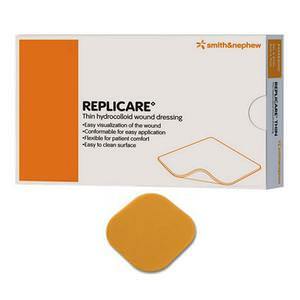 Replicare®'s cohesive properties keep the wound free of dressing residue. Replicare® has a film exterior that is waterproof and aids in prevention of bacterial contamination.